MILLIGAN COLLEGE, TN (August 22, 2008) —Milligan College earned the #6 spot among Best Baccalaureate Colleges in the South in the 2009 edition of “America’s Best Colleges” by U.S. News & World Report. Milligan, up five spots from last year’s #11 ranking, is one of over 100 baccalaureate colleges in the South region and 318 total in the four regions: West, Midwest, North and South. Each year U.S. News looks at 15 indicators of academic excellence for colleges and universities across the United States. These indicators include input measures that reflect a school’s student body, its faculty, and its financial resources, and outcome measures that signal how well the institution does its job of educating students. Indicators include peer assessment, graduation and retention rates, faculty resources, student selectivity, financial resources and alumni giving. Milligan President Don Jeanes said he is pleased by Milligan’s ranking, which reflects the college’s extremely good reputation for providing an excellent education. Milligan was one of more than 200 schools that switched categories in the U.S. News rankings last year due to changes announced by the Carnegie Foundation for the Advancement of Teaching’s classifications. 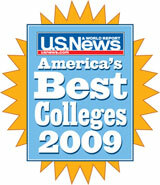 For several years prior, Milligan ranked in the top tier of the “Best Universities-Master’s” category in the South region. The Baccalaureate category is comprised of institutions which focus on undergraduate education and offer a range of degree programs in the liberal arts and in professional fields such as business, nursing and education. The rankings will be published in the magazine’s Sept. 1 issue, on newsstands August 25, and are available online at www.usnews.com beginning today, Aug. 22.